We begin our April issue on a bittersweet note, with a farewell to OVERDRIVE editor Shubhabrata Marmar - we wish you the very best with everything the road brings your way, Shumi! But, spring is in the air, and we've got a bloom of colours on our cover to show it! 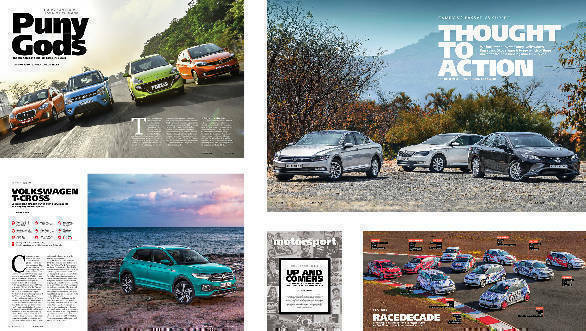 From the latest electric Pininfarina supercar with Mahindra backing, to an array of comparison tests that have you covered whether it's a small hatchback, compact SUV or executive sedan you're looking for, our April 2019 issue has a little of everything.Starting with the biggest BMW there is, the X7, the coupe-SUV BMW X4, and moving on to the Volkswagen T- Cross, the compact SUV to take on the Hyundai Creta, the refreshed Figo and the Bajaj Qute. The question on a lot of people's minds is whether the recently launched new WagonR is a better first car, or even second car, than the all-rounder Hyundai Santro, the stylish Tata Tiago and the refreshed Datsun Go. Of course, you'll have to read our comparison test to see what we think. Another burning question is how Mahindra's entrant to the compact SUV segment, the XUV300, stacks up, against the runaway success that is the Maruti Suzuki Vitara Brezza, the popular Tata Nexon, and the refreshed Ford EcoSport, an SUV which kick-started the segment. At the other end, we pit the all-new Toyota Camry Hybrid against the stately VW Passat and competent Skoda Octavia, to see which executive sedan is the best success statement to live with. 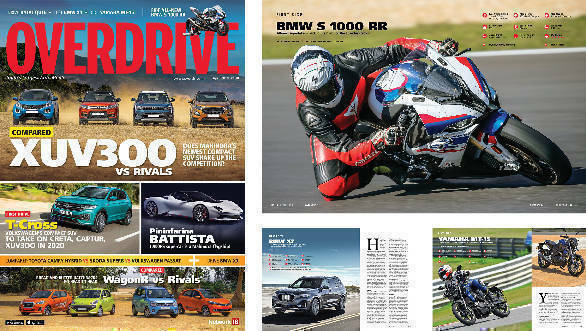 On two wheels, we have a go at BMW's superlative superbike, the S 1000 RR, now meaner, lighter and quicker. Closer to home, we ride another BMW, the F 750 GS, an adv with a fun side, and the Benelli TRK 502 X, a full-size adv with a fun-size sticker price. Last but not the least, we ride the Yamaha MT-15, a naked street motorcycle with an R15's heart.